What would we all do without flatirons? Most of us modern girls are hooked on flat irons! Even though I have straight hair, to get that ultra-smooth finished look, I need a flat iron. It fights frizz and leaves my hair looking polished. But, as we all know, heat tool use over time can wreak havoc on one's hair. I know that I reserve flat iron use for use no more than a couple times a week and always use a heat protection spray in order to protect my hair and minimize my hair's heat exposure. So, how else can we minimize that damage? Kiss offers a potential solution with their new Kiss Silicone Protexion Flat Iron. They have developed an iron with patented silicone technology which promises healthier hair. 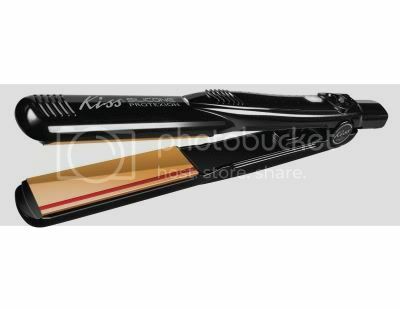 When I heard about the Kiss Flat Iron, I was intrigued and eager to test it out. A flat iron that promises less damage? Sounds promising! To read my full review, please keep reading after the page break. In a nutshell, this iron promises heat protection (via minimizing direct contact to the heated plates) and better moisture retention (from the coating effect of the silicone). This iron gets *hot*! 420 degrees F. The heat up time is 18 seconds and there is heat control adjustment as well. There is an automatic shut off (60 minutes). If you are like me, then you always worry that you left something plugged in at home. I like beauty tools with features like this! Plates are ceramic with silicone "bars" (strips of silicone) on each end. You can purchase the Kiss Silicone Protection Flat Iron online or at Walmart for approximately $50.00. Coupon link!!! Click for a $5.00 off coupon! Kiss offers a 2-year warranty. What makes the Kiss Silicone Protexion Flat iron stand out amongst other flat irons? The silicone coating lines on the ceramic plates. This is what is "different" about this flat iron. At first you look at the coating and think, "thats it? they just look like stripes". But, honestly, it does make sense. Rather than your hair gliding flush across the plates, the silicone bars are raised up a bit and this provides extra "space" between the two plates of the irons. It provides a bit of a cushion for your hair as it glides through. According to Kiss, this decreases the pressure on the hair cuticle and therfore helps hair to retain more moisture. I like this concept! I enjoyed using this flat iron. My hair looks shiny, smooth, frizz-free, and straight after using this iron. Yes, I get this result with most flat irons. But, I know with this one the damage is somewhat lessened. Yes, there is still heat applied to my hair. But, the silicone bars do provide a bit of extra protection. I also loved how hot this iron gets. It heats up super fast too. Definately a professional quality flat iron. I am very pleased with it and it has replaced my previous flat iron. I just like this one better.